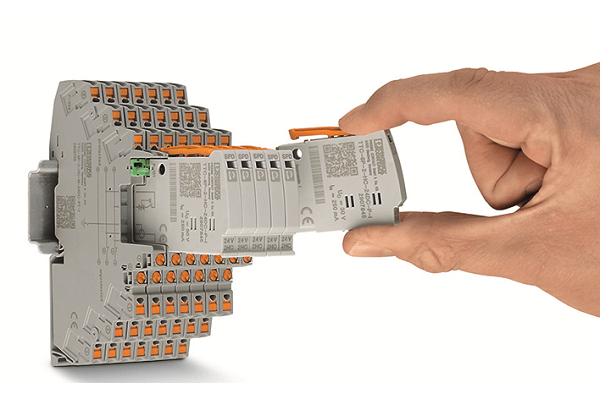 Electrical engineering manufacturer Phoenix Contact has released its new surge protection solution as part of the Termitrab Complete range. According to Phoenix, its new 3.5mm arrester is the world’s narrowest surge protection solution. This aims to allow technicians to build smaller systems to protect analogue and digital signals transmitted using MCR as well as gain installation space for system planning. The 3.5mm device provides the high density for system expansion on the Din-rail, and technicians can expand their systems to protect up to 572 MCR signals per meter. The 3.5mm arrester is available as a push-in model, while the 6.2mm Termitrab is available with screw or push-in connections, knife disconnections, pluggable arrestors, and Ex approval, to meet individual requirements. The 6.2mm arrester models also feature an integrated status indicator that lets technicians see when the unit has reached its end of life and requires replacing. The indicator on the surge protection device does not require any auxiliary power and during the disconnection process, the measuring signal is unaffected, to help ensure the ongoing reliability of the system. Technicians can also choose to install the optional remote signaling module to remotely detect overloaded surge protective devices and maintain the integrity of their system. The module can be retrofitting and does not require any programming or additional wiring. It uses a photoelectric barrier to monitor the status of up to 40 adjacent protective devices and a floating contact transmits thestatus to the control room.